Should you experience headaches or pain in your jaw, the White Orthodontics team is standing by. TMJ is a jaw disorder that can cause these symptoms, and Dr. White a leader in TMJ care and treatment. 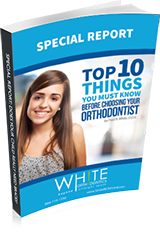 The cutting-edge treatment solutions offered at White Orthodontics can aid in aligning the jaw to provide a healthy bite for an overall healthier smile. Dr White can provide a comprehensive examination to discuss the cause of your symptoms and determine the most appropriate treatment options to help relieve them. One of the tools that aids Dr. White in considering the most effective treatment option for you is the articulator (bite simulator).The jaw position is monitored and the proper bite can be seen with the jaw joints in the correct position. When it comes to your health, we need to strike a balance between bite and jaw position. While there are various remedies you can try at home to relieve symptoms, you should always seek the care of a professional to prevent further dental problems. 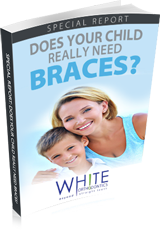 In his 25+ years of experience, Dr White has helped many patients eliminate their headaches and jaw pain while providing a beautiful smile – and more importantly, a healthy bite! If you are experiencing jaw pain or headaches – let Dr. White put his expertise to work for you! Learn more about TMJ treatment here!